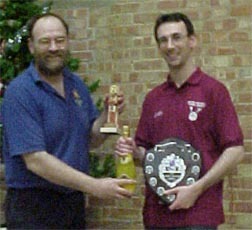 2001 BHGS DBM Annual UK Championship. Phil Steele the President of the Society of Ancients presents the National Rankings awards to the Reigate duo of Iain McNeil and Graham Briggs. 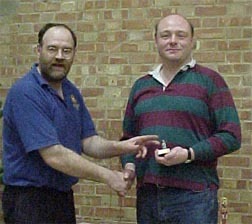 The 3rd placed player John Lavender from Stourbridge was not able to attend Colchester .